Casual comfort with added elegance will be brought into your home with this comfy casual recliner. 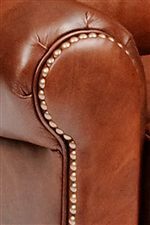 Rolled arms accented by nail head trim all the way up the arm to the side of the chair adds a light flair of style, while the plush seat and split back cushions keep it comfy and casual. Put your legs up and relax after a long day at work with this recliners easy to use recline mechanism. Pick from a variety of leather to find the one that matches your decor beautifully. And this recliner is also available in many different choices of fabric as well. Choose from a manual recline, motorized recline, or a swivel glider reclining chair for one that is perfect for you. 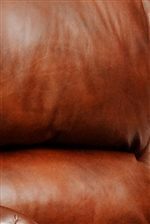 The 720L Casual Leather Manual Reclining Chair by Smith Brothers at Saugerties Furniture Mart in the Poughkeepsie, Kingston, and Albany, New York area. Product availability may vary. Contact us for the most current availability on this product. The 720L collection is a great option if you are looking for furniture in the Poughkeepsie, Kingston, and Albany, New York area.